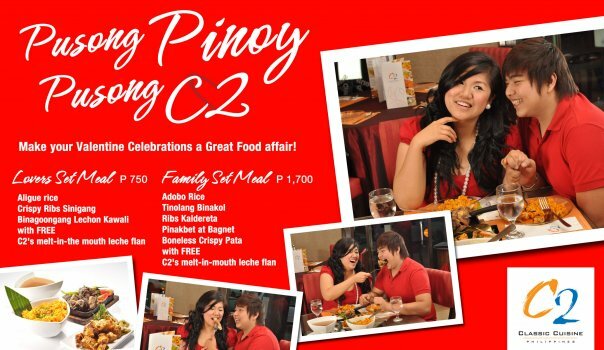 last february 5, with the invitation of my friend who works at c2, junjun and i had a dinner date at c2. we ordered the lover’s set meal which was offered for the valentine’s season. the package included alique rice, crispy ribs sinigang, binagoongang lechon kawali and leche flan. the food was good. i liked how crispy the lechon kawali was and the veggies on its side. the sinigang was also a unique dish. the ribs was done very crispy and it was served separately with the sinigang broth. the sourness of the broth complemented well with the ribs. i loved the leche flan… the description was true… it was melt in the mouth. you can be very sure that there was no egg white used. it was just soft, velvety custard. we also had the bibingka souffle, which is not your usual souffle. you could really taste the saltiness of the egg, the coconut… it is like eating a real bibingka that transformed into a foam-like texture. for drinks (not included in the set meal) we ordered sago and gulaman for junjun and green mango shake for me. our total bill was around Php 1000.00 pesos. the food was great and the ambiance was nice. it is a place where you can share a meal with your loved ones or friends, and catch up with each other’s lives.